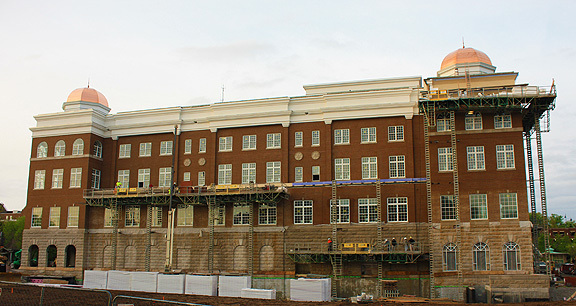 Project obstacles and solutions: The new Belmont University Dining and Academic Complex is a five level, 134,000 square foot multi-use facility that will house classrooms, offices and a 1,000 seat cafeteria. The structure sits atop a 1,020 space parking garage that ties into existing underground parking facilities adjacent to the property. The building features several green building innovations, including a green rooftop and geo-thermal heating and cooling. The project anticipates a LEED Gold Certification. R.C. Matthews was chosen as the general contractor for this project. Construction on the $80 million project broke ground in March 2013. For the next two years, crews poured cast-in-place concrete footings, floors, walls, pillars and decks. The enormity of the project called for very tight construction deadlines. IMI supplied concrete around the clock for the project to help keep the project moving forward. The concrete floors were post tensioned and had to meet 5,000 psi strength requirements in 72 hours before the tendons were stretched. IMI QC/QA designed a mix that met this spec in 48 hours, saving the customer a full day on the schedule for each floor. This included pouring in 15 degrees F during the winter. To meet this challenge, IMI QC/QA added an accelerant in these very cold conditions to keep set times consistent. In total, IMI supplied 20,000 yards of concrete for this project. The new facility is on track to open during the summer. For more information on gaining early high strength in concrete, contact the IMI sales representative for your area. Click here.